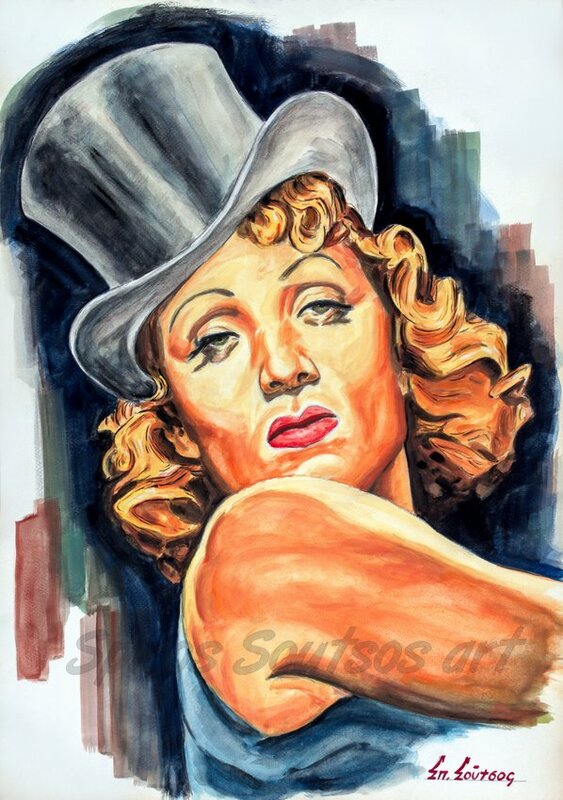 Marlene Dietrich (27 December 1901 – 6 May 1992) was a German actress and singer. Throughout her long career, which spanned from the 1910s to the 1980s, she maintained popularity by continually reinventing herself. In the 1920s in Berlin, Dietrich acted on the stage and in several silent pictures. Her performance as Lola-Lola in Josef von Sternberg‘s classic film, The Blue Angel (1930) brought her international fame. After The Blue Angel’s international success, and with encouragement and promotion from director Josef von Sternberg, who was already established in Hollywood, she moved to the United States under contract to Paramount Pictures. The studio sought to market Dietrich as a German answer to Metro-Goldwyn-Mayer’s Swedish femme-fatale, Greta Garbo. Dietrich starred in six films directed by von Sternberg between 1930 and 1935. Sternberg worked effectively with Dietrich to create the image of a glamorous and mysterious femme fatale. He encouraged her to lose weight and coached her intensively as an actress. She successfully traded on her glamorous persona and “exotic” looks. Dietrich starred in films such as Morocco (1930), Shanghai Express (1932), and Desire (1936) and became one of the highest-paid actresses of the era. Throughout World War II, she was a high-profile entertainer in the United States. After the war, she continued performing in motion pictures, including films of distinguished directors, such as Billy Wilder’s A Foreign Affair (1948), Alfred Hitchcock‘s Stage Fright (1950), Fritz Lang’s Rancho Notorious (1952), B. Wilder’s Witness for the Prosecution (1957) and Orson Welles‘ Touch of Evil (1958). Although her occasional apppearances in pictures, Dietrich spent most of the 1950s to the 1970s touring the world as a marquee live-show performer.